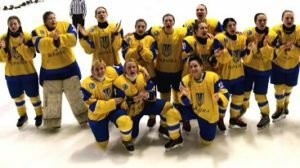 The Ukrainian players come together after winning the deciding game against Belgium to claim first place and promotion at the 2019 IIHF Ice Hockey Women’s World Championship Division II Group B Qualification. For Ukraine’s women national team, victory in Cape Town was a long time in coming. The team swept through the Division II Group B Qualification tournament, defeating Hong Kong, Bulgaria, the host nation South Africa and the top-seeded Belgians to enjoy a memorable start to life in IIHF World Championship play. The competition marked a return to the ice for a Ukrainian women’s team. In the early 90s, shortly after the break-up of the USSR, the country twice played in European Championships with little success. While the men’s team drew on a long hockey tradition to play at 2002 Olympics and spend nine seasons with the World Championship elite, the women slipped away. Girls continued to take up the game, but as they grew up they had nowhere to play. Captain Diana Kovtun was one of them. “I started playing hockey on a boys’ team when I was about 12,” she said. “After a couple of years, I couldn’t keep playing because there’s no mixed hockey for older players. I had to switch to football. The birth of a Ukrainian Women’s Hockey Championship two seasons ago made that dream a reality. It all stemmed from the efforts of Olexandra Slatvytska, Nadia Boboshko and Yulia Artemyeva. The three had come to hockey via different routes: Boboshko’s brother is a pro in the Slovak league, Artemyeva’s son turned her into a hockey mom and Slatvytska was an experienced sports lawyer. Their combined expertise in finance, marketing and law made the dream credible; backing from the Ice Hockey Federation of Ukraine (FHU) saw the creation of a five-team league involving 127 players across four regions of the country. That competition is now in its third season, its leading teams – Kovtun’s Kharkhiv Panthers and Ukrainochka Kyiv – provide the bulk of the national team. But first the girls needed to persuade the FHU that it was time to approach the international stage. When Kyiv staged a men’s U18 World Championship last season, Slatvytska and her colleagues made their pitch. Under the guidance of head coach Vadym Radchenko, whose Kharkhiv team had just won the women’s championship, preparations began for the trip to South Africa. Although the team is almost entirely amateur – Kovtun and forward Yelyzaveta Ryabkina, once captain of Harvard’s NCAA team, are rare exceptions who have played sport at a higher level – the backroom preparations were highly professional. A team of six support staff, led by Radchenko and team manager Yuri Kyrychenko, worked hard on a holistic approach to all aspects of the players’ lives, including diet, exercise regimes and even sleeping patterns. The attention to detail was so great that the team flew its own massage table to Cape Town for the championship, while video coach Nikita Artemyev was supplying insights in the locker room during each intermission. The efforts paid off. Despite the sudden switch from the cold Ukrainian winter to a southern hemisphere summer – “it was so warm on the ice we found it difficult to breathe at our first practice,” admitted Kovtun – the team produced some high-quality hockey to win all four games with an aggregate score of 17-5. “It was really important for us,” Kovtun added. “We were nervous before the tournament. We felt that we were representing our country here and we didn’t know what to expect. So we prepared very hard and we knew that we had a strong roster. Now the plan is to build on that. Slatvytska estimates that there are around 120 under-15 girls playing hockey in Ukraine and hopes that this week’s success will inspire them and bring more youngsters to the game. The league is working to bring in some international officials to help raise standards; already, clubs benefit from large amounts of data designed to help coaches monitor and improve player performance. On the international stage, the women’s team is actively seeking more opponents: more than 35 national federations have been invited to send teams to joint training camps in Ukraine, taking advantage of some impressive facilities in an immersive hockey environment without the costs associated with similar events elsewhere in Europe.